← Osa Conservation featured by The New York Times! As its name suggests, breadfruit is a fruit that has the same texture as baked bread and it has what many call a potato-like flavor. Part of the Mulberry Tree family that originated in the South Pacific region, almost 300 years ago, this overlooked flowering tree has recently become a hot topic in discussing hunger, poverty and nutrition. With multiple health benefits and the nutritional value this fruit provides, breadfruit could be the next super food and staple. Originally from present-day New Guinea, breadfruit has been cultivated for over 300,000 years and was introduced to the Western world by British explorers like Captain James Cook and William Bligh. Each of them, on their respective voyages, began to transport and spread the breadfruit tree to tropical regions like the Caribbean. Once there, the trees were successfully introduced and planted, being able to produce the so desired fruit. In fact, there are places where you can still find some of the original trees cultivated over 200 years ago. Breadfruit has a wide range of adaptability to various environmental conditions within the tropics. The best conditions for growth is found in the tropics, where the temperature stays between a warm 70-90 degrees Fahrenheit year round. For example, in Costa Rica the fruit is commonly found along its Caribbean coast, from Tortuguero south through Limon, Cahuita, Puerto Viejo and Manzanillo which are all places that provide the best conditions for its growth. Also, it is locally known as “fruta de pan”. Breadfruit flourishes in areas where there is an annual rainfall of 59-118 inches and soil needs to be fertile, well-drained, and deep enough for optimal growth. However, some breadfruit plants somehow manage to adapt to the shallow, sandy soils of the Pacific. They have even been seen to grow on rocky, volcanic soils in Hawaii. 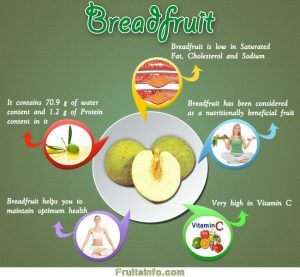 Breadfruit has many health benefits and holds more nutritional value than assumed. Eating this plant you get 102 calories. Within the flesh of the fruit it holds a decent amount of fiber, Vitamin-C, carbohydrates, is an excellent source of potassium, and even contains small amounts of flavonoid anti-oxidants. Snacking on breadfruit can help reduce blood cholesterol, obesity, blood pressure, and helps regulate heart rate. When preparing ripe, or mature, breadfruit for consumption, it is recommended for the plant to be either roasted, baked, fried, or boiled! This is just to bring out the abundant flavors the plant provides. But, you don’t have to wait until the breadfruit has ripened to eat it. Immature fruits can also be cooked, pickled, or marinated, imparting a flavor similarly to that of artichoke hearts. Thinly slicing these fruits can even be fried or baked to make homemade chips. Yum! As for the conservation context, the National Tropical Botanical Garden (NTBG) states that breadfruit also contributes to diversified sustainable agriculture and agroforestry, improved soil conditions and watersheds, and valuable environmental benefits including the reduction of CO2. Will Breadfruit End Global Hunger? According to the NTBG, more than 80% of the world’s hunger-stricken communities live in tropical, or subtropical, regions — the type of environment that is perfect for growing breadfruit trees. Organizations like Global Breadfruit and NTBG Breadfruit Institute are dedicated to promoting the super food and spreading it to areas of the world that need it most. “Every time we plant one of these trees, we’re reducing the susceptibility to famine and starvation in the country where the tree is going,” said Josh Schneider a horticulturist and partner to Global Breadfruit. 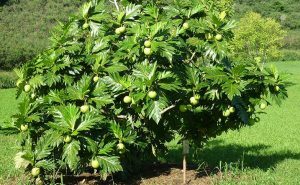 Schneider has been working with the botanical scientists and the Breadfruit Institute in Hawaii to reproduce breadfruit trees and transport them to the areas that need the most help. The Trees That Feed Foundation, for example, is planting more breadfruit trees in Haiti in effort to feed at least 1,000 orphans every day. These trees are very easy to maintain and can bear an abundance of fruit for decades. Horticultural partnerships like these help with the outstanding and healthy shipping of young plants that within time will grow into productive trees. Altogether, these alliances surely contribute to the alleviation of hunger issues but also, and not less importantly, they make widespread cultivation and reforestation feasible. It sounds like there is a hunger, environmental and conservation hero in our midst; so let’s start planting!